^ Getrisc Smith. History of the Mark Twain National Forest. Mark Twain National Forest. US Forest Service. 2007-06-18 [2009-09-30]. ^ 2.0 2.1 Haynes, Gary. The Early Settlement of North America: The Clovis Era. New York: Cambridge University Press. 2002: 52. ISBN 0521524636. 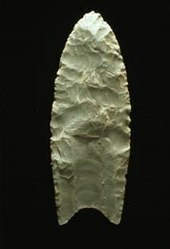 ^ Southeastern Prehistory: Paleoindian Period. National Park Service. [2008-04-28]. ^ Lepper, Bradley T. Pleistocene Peoples of Midcontinental North America. (编) Bonnichsen, Robson; Turnmire, Karen. Ice Age People of North America. Corvallis: Oregon State University Press. 1999: 362–94. ^ McLean, Dewey. A climate change mammalian population collapse mechanism. (编) Kainlauri, E., Johansson, A., Kurki-Suonio, I., and Geshwiler, M., eds. Energy and Environment. Atlanta, Georgia: ASHRAE. 1991: 93–100 [2008-07-04]. （原始内容存档于2008-08-20）. ^ Allen West and Albert Goodyear. The Clovis Comet Part I:Evidence for a Cosmic Collision 12,900 Years Ago (PDF). Mammoth Trumpet. January 2009, 23 (1) [2009-10-01]. （原始内容 (PDF)存档于2008-10-28）. ^ 大陸新聞中心／綜合報導,"驚！摧毀1.3萬年前地球文明　竟不是彗星碎片～",NOWnews 今日新聞網,2013年2月10日 21:29. ^ Michael R. Waters and Thomas W. Stafford, Jr. Redefining the Age of Clovis: Implications for the Peopling of the Americas. Science. 2007, 315 (5815): 1122–6. doi:10.1126/science.1137166. ^ Michael Balter. Ancient Algae Suggest Sea Rount for First Americans. Science. 2008, 320 (5877): 729. doi:10.1126/science.320.5877.729. ^ University Of South Carolina. New Evidence Puts Man In North America 50,000 Years Ago. ScienceDaily. 2004-11-18 [2009-10-01]. ^ Marsha Walton and Michael Coren. Scientist: Man in Americas earlier than thought. CNN. 2004-11-18 [2009-10-01]. ^ Kazi Stastna. Clovis people not 1st to arrive in North America. CBC. 2012-07-12. ^ Ancient American's genome mapped. BBC News. 2014-02-14.